Guaranteed Late Checkout — Gold and Platinum members may checkout as late as 4pm if they ask. This benefit is guaranteed at all participating Marriott Rewards hotels, except at resort and convention hotels, where it is based upon availability. Marriott Vacation Club is excluded. Guaranteed late checkout launches globally on May 16. One of the hottest topics in the points and miles world is the pending Starwood and Marriott merger — with Anbang now out of the way, it’s clear that the merger will likely move forward as planned. We now know that will mean the end of Starwood Preferred Guest as we know it, though Marriott’s CEO has repeatedly said that he plans to make the new combined loyalty program even stronger. Today’s news is definitely a step in that direction. Throughout the next month, Marriott Rewards will introduce three new programs: Experiences Marketplace, Elite Concierge Service and Guaranteed Late Check-Out — all three are existing perks of Starwood Preferred Guest. Let’s see how Marriott breaks them down. With the experiences marketplace, all Marriott Rewards and The Ritz-Carlton Rewards Members can pursue their passions by choosing from a wide array of curated special events and opportunities for discovery. Whether it’s tickets to one of the hottest shows on Broadway; a once-in-a-lifetime chance to hang out with your favorite sports team; or a private cooking lesson or wine tasting with a world-famous chef or sommelier, members can redeem Marriott Rewards or The Ritz-Carlton Rewards points to access a marketplace of unique experiences that allow them to explore their personal interests in the most meaningful and memorable ways. The experiences marketplace will be available globally to all members in late May. So this sounds very similar to SPG’s Moments program, which presents members with fantastic opportunities to redeem Starpoints for incredible experiences, be it Suite seats at a Knicks game or VIP access to concerts in Vegas. It’s great to see that this isn’t going away! SPG Moments allows members to redeem points for NBA games. An initial group of Elite members of Marriott Rewards will be invited to participate in a new Elite concierge service. By developing a relationship with the member, the concierge will be able to anticipate their unique needs, ensuring the member’s preferences are recognized and their desires are met before, during, and even after their stay. The concierge will be able to reserve on-property amenities like restaurants, spa treatments and golf, as well as make arrangements for special occasions. The service will launch in late May first for U.S. members of Marriott Rewards traveling worldwide and will continue to expand. Marriott Rewards will actively engage with this group of charter members and seek their feedback to refine the service. 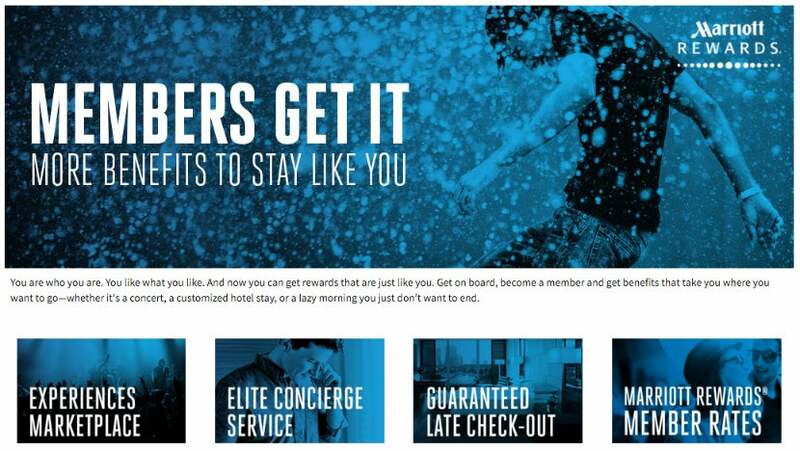 Elite Concierge Service sounds familiar as well — it’s clearly modeled after SPG’s Ambassador program, which pairs members with a dedicated Ambassador after they earn 100+ night credits in a calendar year. The program can be a bit hit or miss, but if you manage to land a fantastic Ambassador, it can definitely add some value to Starwood Preferred Guest. The guaranteed late checkout benefit will be available to Gold and Platinum Elite members of both Marriott Rewards and The Ritz-Carlton Rewards who will enjoy a more seamless travel experience when planning their trip. These members will receive a guaranteed late checkout, which could be as late as 4pm. Members can request the late checkout when making a reservation by phone, when checking in using the Marriott Mobile app, or upon arrival at the hotel. This benefit is available at all fully participating Marriott Rewards hotels with the exclusion of resorts, convention hotels and Marriott Vacation Club. Marriott Rewards and The Ritz-Carlton Rewards will continue to offer Silver Elite members the benefit of requesting late checkout on their day of departure. Guaranteed late checkout launches globally on May 16. No surprises here! Guaranteed Late Checkout is a key benefit of Starwood Preferred Guest, so it’s great to see that Marriott will be adopting this feature sooner than later, although it’s being implemented a bit differently — rather than a guaranteed 4pm checkout, Marriott’s saying the checkout “could be as late as 4pm,” so that’ll likely be at the hotel’s discretion. Late checkout will be available to both Platinum and Gold members. Unfortunately resorts are excluded, but that’s in line with SPG. And if you ask nicely at check-in and the hotel can accommodate you, I’ve found that Starwood resorts are more than happy to oblige. Maybe the Marriott merger won’t be so bad for SPG after all. All three of these perks are fantastic additions to Marriott Rewards. While it’s clear that there will be some adjustments to both programs once Marriott and Starwood merge later this year, Marriott is clearly invested in preserving value. Hopefully there’s much more (positive) news to come! Featured image courtesy of Renaissance Sharm El Sheikh. How do you feel about the Marriott merger?